With the rapid spread of global terrorism and the accelerated decline of moral values in the Western world, Sammy Tippit issues an urgent call for spiritual awakening. He writes that the greatest threat lies deep within our own hearts. He calls the church to awaken from her slumber and allow God’s light to shine brightly during these dark days. When darkness creeps into the cuture, God looks for men and women through whom He can shine. Light in the Darkness is filled with riveting stories of people whose lives have reflected God’s glory in some of the darkest regions of the world. It presents their testimonies and the truths that allow God’s light to dispel the darkness. Sammy Tippit has spent nearly a half-century ministering in dark and dangerous nations, where Christians have been severely persecuted. He’s witnessed God’s light shatter the darkness in Eastern Europe, Africa, and the Middle East. He was in Romania during the revolution, Rwanda immediately following the genocide, and Burundi during the war. The Light in the Darkness paperback book is the print version of the three e-books .. The Approaching Darkness, Character in the Darkness and God’s Glory in the Darkness. 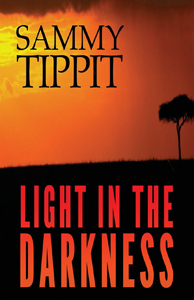 To purchase Light in the Darkness from Sammy Tippit Books with PayPal, go HERE!!. To purchase Light in the Darkness from Amazon.com, go HERE! !.